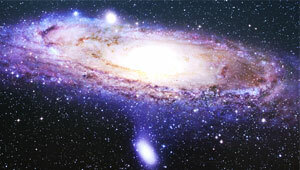 Astrobiology is the study of the origin, evolution, and distribution of life in the universe. The International Astronomical Union's Commission 51 was established in 1982 as "Bioastronomy: Search for Extraterrestrial Life" and was renamed simply "Bioastronomy" in 2006. After the commission reform exercise in 2015, it is now the International Astronomical Union's Commission F3 "Astrobiology". Astrobiology encompasses the search for extant life, evidence of past life, or evidence of prebiotic chemistry on solar system bodies, including Mars, Europa, Titan and Enceladus; the search for planets around other stars and potential spectroscopic evidence and habitability and biological activity; the origin of the biogenic chemical elements and the study of biologically relevant molecules in the interstellar medium and in primitive solar system objects such as comets, undifferentiated asteroids and some meteorites; the search for intelligent signals of extraterrestrial origin; the study of the origin, early evolution, and environmental constraints for life on Earth; the coordination of efforts in all these areas at the international level; and the establishment of collaborative programs with other international scientific societies with related interests. © Commission F3, International Astronomical Union.